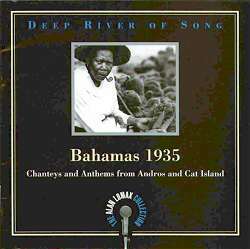 The sweetness of a voice rings out over a deep bass and extraneous fuzz in Round the Bay of Mexico, one of the more charming chanteys heard on Bahamas 1935. The song is led by Henry Lundy, and bassed by David "Pappie" Pryor. This song and most of the music found on this CD are products of the sponging days in the Bahamas when sponging crews would spend weeks at a time on the water in small sailboats. It is primarily group vocal music and contains echoes of many other African-American and Afro-Caribbean vocal group forms, including spirituals, quartet singing, and work songs. The characteristic style of singing found on most of the songs is known as rhyming. A lead singer, or rhymer, usually begins the song by establishing the melody. This melody is then taken up by a group of singers, or sometimes a single bass singer, which utilize multiple tempos, tonal levels, and rhythmic patterns to create a complex song structure over which the lead singer or rhymer can continue to improvise new lyrics or rhymes. The effect is not far from quartet singing, though the multiple rhythms and tempos make for a generally more complex song style. Apparently this complex style of singing found its heyday in the early 1900's when spongers were plentiful and sharply declined with the failure of the sponge industry in the late 1930s. Lomax, who recorded in 1935, appears to have arrived just before this decline and fortuitously so, in my opinion, for one thing that impressed me about these early recordings was the breadth of rhyming that could be heard when compared to later recordings of Bahamian rhyming, those found on the Rounder release 'Kneelin Down Inside the Gate', for instance. Lomax, in an essay included in the booklet notes, proposes that the particular style of singing employed in Bahamian rhyming music stems from the Bahamian sponger's connection to the sea. He writes: "The distinctive effect of multiple tempos [found in the music] ... flows ... from the marriage of Bahamians to the sea and small sailboats. A sailboat moving through the sea before a good wind moves in several tempos: the lift, plunge and roll of the vessel through the water, and the forward motion of the boat itself, which increases imperceptibly and with an effect of mounting thrill as sails are trimmed and as the breeze picks up. Other rhythms can be heard in the rapid slatting of ropes against the sail, the slow creaking of the mast and the blocks, and the slide of water along the side and perhaps against the deck." While Lomax's descriptions tend to err toward the overly romantic or sentimental, upon listening to the music, I do believe there is some connection between the profession (spongers) of the singers and the music they created. My instinct tells me the music is rooted in their work experience. As I mentioned earlier, many of the songs, while original in style of performance to the Bahamas, seem to share elements in common with work songs from other parts of the Americas, particularly the emphasis on collective singing and the use of vocal rhythms to mark beats for various work related activities, for instance chopping, or pulling, or hoeing, or perhaps most important, relaxing. The songs on the CD are divided into two genres, chanteys and anthems. The chanteys are comprised of sea chanteys and launching songs, often variations of sea chanteys from the British Isles or other parts of the Americas. The anthems are spirituals sung by groups of men, often in the context of wakes. At times the differences between these genres seem obvious while at other times they are blurred, as Bahamian 'rhyming' is the employed technique in both genres. Perhaps the greatest difference between the two genres is in the text. Chanteys usually contain verses on life at sea, sailing, storms, and other matters pertaining to fisherman and seafarer. The texts of the anthems are almost exclusively religions in nature. Perhaps the two most famous of the chanteys included here are Roll Him Along and Histe Up the John B Sail. Roll Him Along is a local version of Blow the Man Down, a sea chantey well-known throughout the Caribbean (a version from Carriacou is included on the release Carriacou Calaloo). Histe Up the John B Sail is apparently a Bahamian original. However, this chantey was made world-famous by the folk revival group the Weavers in the 1950s. According to the booklet notes, this version included here may be the earliest recording of this song. More characteristic of the 'chantey' in sound and form are Stand Up from Below and When the Whale Get Strike. Stand Up from Below, sung out of tune for the most part by Zacharias Green, sounds to these American ears as if it just arrived from the British Isles. When the Whale Get Strike, which follows, is similar to chanteys heard off the northeast coast of the United States. Job, recorded at a sponge dock on Nassau, features a quartet of anonymous male singers, one with an incredible piercingly high voice. His continuous calls of "O glory" and "O my lord" punctuate a string of barely understandable verses laid down by the lead singer or rhymer. The effect is stunning to say the least. A word about the singers. David 'Pappie' Pryor, who bassed Round the Bay of Mexico, came from a family of singers and is reported to have worked with sponging crews. He is featured on the majority of songs on the CD and Lomax apparently considered Pryor an artist of Ledbetter's caliber. While Pryor's vocal range and strength are indeed impressive, I was struck by the unassuming quality yet intense sweetness of many of the Bahamian singers, most who remained anonymous. I was particularly impressed with Henry Lundys' voice, that often gave me feel I was being invited into a private conversation. I've heard examples of other musical styles Lomax recorded in the Bahamas including a calypso, a jumping dance and pass-play song. These were included along with Round the Bay of Mexico and Dig My Grave, on the album Bahamian Songs, French Ballads and Dance Tunes, Spanish Religious Songs and Game Songs released by the Library of Congress in 1942. I do believe this CD could have benefited from some of the variety these other recordings could offer - however, on the whole I think this CD is adequate as an early collection of a distinctive, engaging Bahamian song style. Still, my hope is that Rounder opts to release more material from the Bahamas that will include selections from some of these other genres. For those expecting to hear sounds representative of Lomax's Caribbean Voyage series on this release, a word of caution. These recordings were made in 1935, some fifteen years before Lomax made his Caribbean Voyage recordings. The recording quality and technique are reflective of this and the recordings lack the clarity and vibrancy heard on those later collections. However, you can find yourself absorbed in this music, given enough time. It's music that requires some attention, and for those who enjoy a clean recording, a bit of patience. First, I don't recommend putting this on as background music. I'll bet that if you do, the majority of the songs will end up sounding the same, in part because of the nature of the music itself and in part because of the poor technical quality, with various wheezes pops and fuzz heard throughout. Second, I recommend digesting this CD in two-five song blocks. This seems an odd suggestion even to me, but I found that much of the beauty of many of these songs is in their variations from each other, variations which I feel are easily missed as the overall experience of the music begins to accumulate. Of course, there are always exceptions. Some will pick up this CD and breeze right through it and wonder why anyone could suggest staggering their listening experience. Others will hear one song on this CD and know right away that it is not for them. I am speaking to those who fall somewhere in between in the hope that they will give this music a fair chance.